Upscale wine country estate with 5 bedrooms, 3 full bathrooms, 1 half bathroom, sleeps 12. Why stay in a rental when you can vacation like an owner in this upscale Wine Country Estate Home with model furnishings? 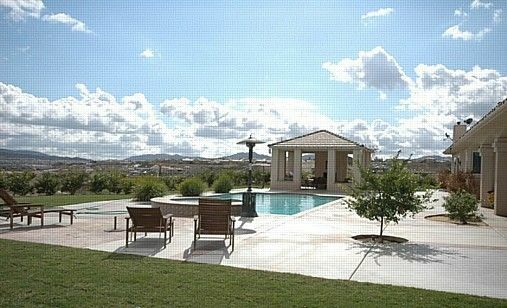 Experience all the tranquility of Temecula Valley's Wine Country on this five acre 4200 Sqft., 5 bedroom, single story estate home with pool. Adventure on a hot air balloon ride right over your back yard! Get away from the sounds of the city and fall asleep to the soothing quiet. Melt into world-class beds and luxurious amenities. Experience California's rural suburb in upscale, luxury accommodations that deliver Wine Country living at its finest. If you're looking to spend your So. California vacation in a quaint historical town in a quiet area, only 1 hour to San Diego, Orange County, Riverside County and L.A. County, this is the place for you! It has a variety of excellent restaurants, Casino, Wineries, Golf to help you get away from it all. Only a one-hour drive from world-famous San Diego Zoo, Wild Animal Park, LegoLand, and the beach. No Events, Weddings Or Parties. Enjoy one of the 23 Temecula Wineries and all that they have to offer within a few minutes of the house. Visit Thornton, Callaway, Baily, and Filsinger's vineyards and wineries to name a few. Enjoy one of the many restaurants for lunch or dinner or go to a jazz concert at Thornton Winery. Treat yourself to a massage at the South Coast Winery Resort and Spa. We can also hook you up with a wine country shuttle that will take you right from our front door for a Temecula Wine Tasting Tour. Take a hot air balloon ride over Temecula's wine country. What a fabulous way to start your morning. It is not uncommon to have hot air balloons fly right over our home on occasion. What a fun sight to see. Pechanga Casino or Temecula Old Town: Within 10 minutes of our home you will also find Pechanga, California’s biggest casino. A multitude of AAA 4-Diamond amenities and services make Pechanga California’s best! Here you can enjoy concerts, boxing, comedy shows, gaming, restaurants and night clubs. Temecula's Old Town also offers a wide variety of Restaurants, Antique Shops, Live Theater Entertainment, and more. Many activities such as the Rod Run, Sunday Farmer's Markets, etc. also take place in Old Town. Old town is also found within 10 minutes of our home. No events, weddings, or parties allowed. Rented the house out for a ladies weekend and we really enjoyed our stay. The house has a perfect layout for group entertainment. Loved the large kitchen opening into living room with plenty of space for everyone to sit together. Really enjoyed the outside area as well. The only downside we had was that we were unable to use the hot tub either night we stayed. We should have reported it after we weren’t able to get it hot on Friday, but we got carried away with our pre-scheduled activities on Sat and didn’t report it to the owners until Sat evening which of course meant they couldn’t get anyone out to repair at that time. That is the only hiccup to our stay. Comfortable beds, beautiful house inside and out, property management lives close by and they walked me thru the house so we knew how to use everything. Even had a bottle of champagne to start our weekend off =) Definitely recommend this place to anyone going to the area. Wineries and downtown are a short drive away, but you get to enjoy a more country/remote feel by staying here. Accomodations went well. The gate broke the day we arrived. I would suggest having tissues in bathroom. The living room/kitchen area's perfect for hanging out. 10 of us for the weekend to watch the super bowl, the pool table helped pass the time on a weekend of constant rain. Master bedroom suite's impressive. Wish the weather would have allowed us to utilize the pool area. Great layout and plenty of space both inside and out for our group of 10. Hosts are great and Linda took time to explain all of the features and amenities. She even encouraged us to pick the oranges :) Would stay here again for sure! Amazing kitchen and game room!!! Had a terrific stay at this beautiful home in Temecula. The kitchen is fabulous and all the games were so much fun! Very close to the winery. Great memories with family and friends. The house was perfect for a relaxing girls get away. Beautiful house and the pool was a hit. Located so close to town but was very private and had a nice view. Nice and clean, had lots of amenities including a fully stocked kitchen. Our entire group would love to go back again!! Golf: Enjoy one of Temecula Valleys Outstanding Golf Courses. Many within 10 minutes from our home. Cross Creek Golf Club, Temecula Creek Inn Golf Course, Redhawk Golf Course, Temeku Hills Golf Course, Bear Creek Golf and Country Club and SCGA Golf Course. Enjoy the pool or have a fabulous BBQ after a great day on the Course.